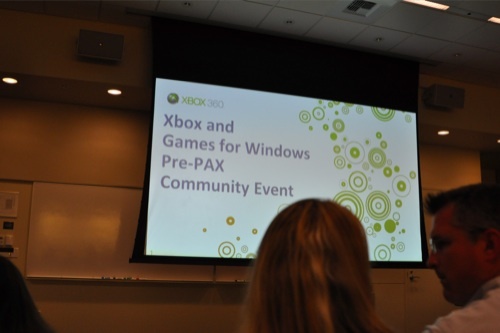 The first of our PAX events yesterday was Microsoft's Pre-PAX Community event. An exclusive event for around 100 VIPs, Microsoft invited folks out to check out their new campus, get hands on time with tons of games, and chat it up with developers and publishers about upcoming GFW Live and Xbox 360 titles. So what did we see? From the co-op side we got our hands on some goodies like Borderlands, Alien Breed Evolution, Left 4 Dead 2 (Both PC and 360) and Halo 3: ODST. But that's not all there was, in fact, almost 3 dozen titles and features were up for getting are hands on. Up first was our tour of Microsoft's new Studio campus for their Entertainment and Devices division. This four building campus houses XBox, Zune, and other entertainment related offices. But offices aren't all that's offered, there's a handful of restaurants, art galleries, massage parlors and salons. 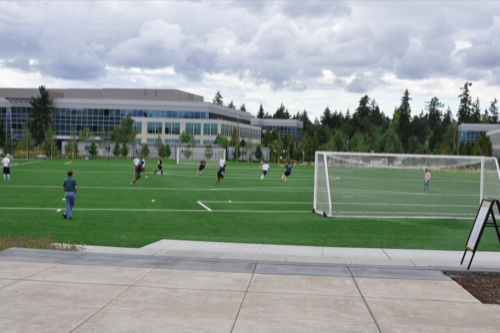 Oh, and there's a soccer field. A full sized soccer field. 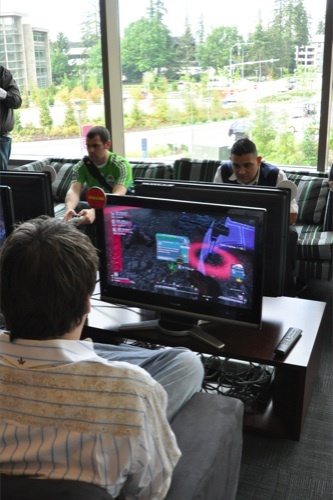 The campus also houses one of the most advanced testing facilities in the world for gaming. With literally thousands of people cycling through it a year to help tweak, test and enjoy games before they are released. It's here that little aspects of games are adjusted. A good example was the first level of Halo 3, the one set in a jungle, had testers getting lost pretty consistently. Because of this data they decided to put the entire level on a slight downgrade, which once tested, gave people the right push in the right direction. We're going to post more detailed impressions of some of the games later, but we made sure to play some co-op in titles like Left 4 Dead 2, Borderlands and Halo 3: ODST. We immediately flocked to Borderlands because of the beautiful visuals and the promise of an in depth action/RPG-ish experience. We weren't disappointed with the game's four player drop in and drop out. It looks every bit as gorgeous in person as it does in the screens. We snagged level 20 characters and worked on clearing out a valley of some pretty big bugs and monsters. It's immediately obvious teamwork is crucial to bring down these creatures. It was tough not to be distracted by the myriad of items and objects to pick up, looking at stats, etc. Moving on next was Left 4 Dead 2. The level we played on the PC was outdoors on a highway at dusk. Cars and bodies were strewn everywhere, and it was disorienting to find our way. Soon we found a Samurai sword and it wasn't long before we were lopping limbs off zombies left and right. It was extremely satisfying, perhaps a little too satisfying. But our plans were soon ruined by a Jockey, who mounted the on screen character and road her around like some sick demented horse. Game over man, game over. We finally walked over and checked out Halo 3: ODST and got some good co-op time with it. We immediately noticed that ODST's are a bit slower than Spartans, and just a bunch of subtle tweaks that made the game feel different. It was a limited 10 minutes of demo time, and a bit of a tease. We'll have more detailed write ups on these games shortly!